Modi came to power with a bang. Riding on the support of the Corporate World, the RSS combine, the media blitz and the promises of sky; he managed to get 31% of votes and 262 seats in the Lok Sabha. This is the first time BJP managed a simple majority in lower house of Parliament. This also became an occasion for Modi-BJP- RSS to unfold their agenda in full. While economic promises have floundered, the protective policies for the average downtrodden have been partly retracted along with the claims of great economic achievement by RSS combine and its supporters. The reality of economic situation has forced the substantial section of media to take cognizance of the plight of the people and criticize the failure of the Government on economic and many other fronts. The social scenario has been dismal, the growing intolerance, the attack on autonomy of universities, the treatment of dalits, as reflected in the death of Rohith Vemula, the intimidation of religious minorities through issues like beef, Bharat Mata ki jai, and nationalism have dominated the scene. By now most of the people are clear that RSS is in the driving seat supervising the total unfoldment of its agenda of Hindu nationalism. 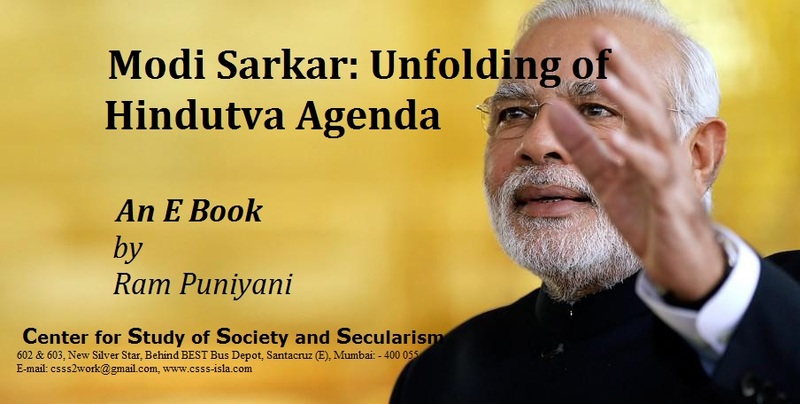 This e-book is a compilation of my articles written on the theme during last two years. The idea was to take a stock of the direction of the present regime and its attack on democratic, plural ethos of the country. 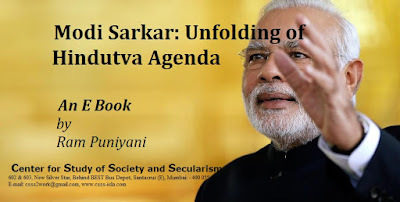 I hope this will help readers to comprehensively assess this regime, its promises and reality and its deeper agenda of Hindu nationalism.